Taken at the Royal Hotel, Invergordon. Sadly Mum and my stepfather, Angus are no longer with us, so I will need help namimg everyone here? I will try my best! Left to Right (as in - 'all one' row): Mr and Mrs Paddy Scourfield; Mary Ledingham; ? 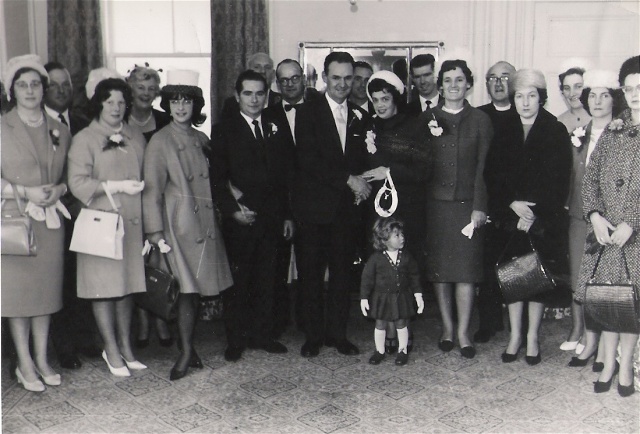 ; my sister, Shirley Maureen Booth; Bill Chapman, Alec Urquhart, Kenny Mackenzie; my stepfather, Angus Mackenzie, Simon Clark, my mum, Fay Mackenzie; George Sutherland ?, Isabel Urquhart, Minister - Alan Shearer; Cath Chapman; Violet Sutherland; ? ; Jean Clark. The little girl is the daughter of Mr & Mrs Sutherland. I think the lady third from the left of the picture at the back is Frances Borley. Is the little girl Jacqueline (Jacqui) Sutherland? Graham, I think you are probably right. Angus worked in Gilbert Ross's at the time, when Mr Borley was there. Harry, thank you - I thought it would bring back nice memories for so many people. This is what this site is all about - I think it's great. Yes - 'Jackie', I'm sure that's what the little girl's name was and her dad's nickname 'Pico'! It all comes 'back to you' when you see all the familiar names! Pico was so tragically killed in an accident at work. Along with two of his brothers Alex and Billie (Aggie) I remember him playing right-wing at football for Inverg. Yes Rod, I was very saddened indeed to hear about Pico, another natural as a footballer, and just an all-round nice person. I was privileged to have known him. I was so sorry to hear that 'Pico' was tragically killed. Heather, you seem to have a wonderful store of photos which is lovely to see. I recognised George Sutherland straightaway (Pico). So sad to hear of his death. He was so young. I also knew his wife, Violet. Rosalie - thanks for your kind comment. I only discovered this site a few weeks ago and have had much pleasure looking at so many of the contributions. Sadly, Angus died 10 years ago and Mum a year ago. I felt I owed it to them to share the many pictures they had of themsleves and their family and friends in Invergordon. They would have been 'tickled pink' that I have put so many of their old pictures (and many of my own)on, to share and give enjoyment to others. Yes - it was very tragic re Pico. I am glad this picture brought back fond memories of him to so many others. What a great site this is. Heather, your photos brought back so many memories. Sorry to hear of your Mum's death and Angus's. I don't think I knew your Mum but I knew Angus well. He was such a good man and well respected by everyone who knew him. Rosalie - thank you. Your words have been echoed by all who knew Angus. I was proud to call him my stepfather for over 30 years. Mrs Borlay next to Mary Led; Mary Sutherland next to Cath Chapman. I am Marsden Scourfield, the nephew of Leslie Scourfield, who appears to have been called Paddy in Scotland. Can any one tell me how Leslie ended up in Invergordon and - why was he not called Taffy - why Paddy? I first met Paddy through my father, Captain Booth, when I was 10. At that time, I too wondered why a Welshman was called Paddy! No-one was able to tell me - except that "he had always been known as 'Paddy'! It probably started off as a joke and stuck - however, perhaps someone else can throw a light on the subject, and also be able to tell you how Paddy ended up in Invergordon? Can I just say what a lovely lovely man he was - always smiling. Marsden, often wondered that myself as Taffy or Taff seemed more appropriate. I do not know why he ended up in Invergordon, but he worked on the Harbour Masters launch. Did he have a naval background? anyway he is mentioned several times on this site, particularly under Pilot Boat. In 1958/59 HMS Saintes, a RN Destroyer, visited Invergordon. The whole ships company were made to feel so welcome. A dance was held in town I was lucky enough to get talking to and dancing with a very pretty and charming young lady. Her name was Isabel Urquhart. We were both about 17/18 at the time. At the end of the evening I asked if I might walk her home. Little did know what a task that would be, especially in the pitch black on the way back. It must have been midnight or one o'clock in the morning. I was introduced to Mother and Father Urquhart. Dad offered me a glass of whiskey and Mum gave me a cake that she had just baked. We chatted and spent a wonderful hour, I then stumbled off in full uniform to join my ship, An experience and name I have never forgotten. I am now 78, with four kids, 12 grandchildren and 3 G/grandchildren. Does anyone know the Isabel of that evening, If so please give her my regards and thanks..